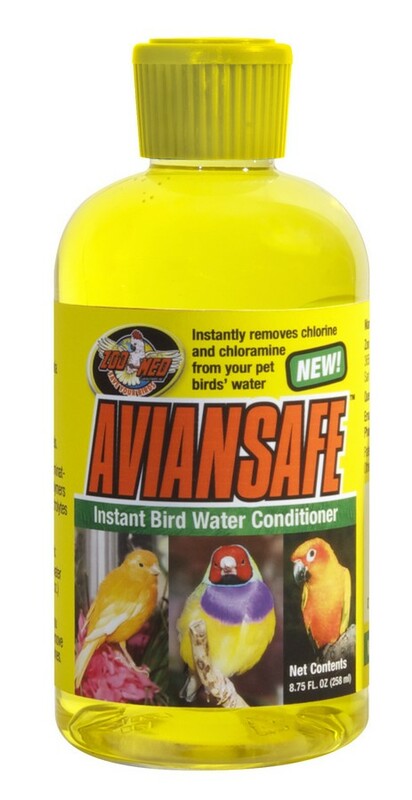 AvianSafe™ Water Conditioner | Zoo Med Laboratories, Inc.
AvianSafe™ is a new instant water conditioner that removes chlorine and chloramines from your pet birds’ water. Use to treat your birds’ drinking water. Removes chlorine and ammonia from tap water. Adds essential electrolytes (including calcium). Aids in rehydrating new arrivals. Add 2 drops of AvianSafe™ Water Conditioner to each cup (8 fl oz) of tap water. Use AvianSafe™ each time you change your birds water to remove harmful chlorine and chloramines.